I've recently had complaints of itching from my family (TMI??) so I was more than happy to try out a new laundry detergent from Purex when it came. I was waiting to post the review because I was expecting some big spill or stain that I could test it on but nothing really happened. I have two toddlers, that's amazing right? :) I can tell you that there is now no more itching in my house and that the clothes come out smelling good and clean. It works great getting rid of the day to day dirt, etc. I would recommend Purex laundry detergent to those that want clean and bright clothes. Triple Action is a new and improved formula that is reasonably priced. This laundry detergent will work in both traditional and HE washers! 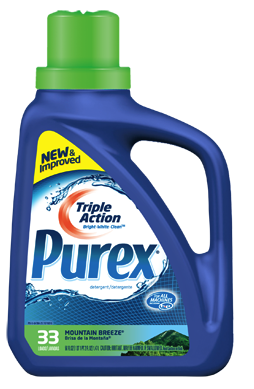 Purex is giving away a Full Size bottle of Triple Action Purex! 3 Winners! Giveaway will end Wednesday January 25th at Midnight MST. Winner will be chosen by Random.org. Purex provided a free sample of their Triple Action laundry detergent so I could write a review. All opinions are my own. All information gathered for the giveaway will be discarded when over. Your privacy is important.